For this week’s post I have interviewed Ms. MaryBeth Quandt, a student and instructor of Shin Ho Kwan Taekwondo. Ms. Quandt has been learning and teaching Taekwondo for many years. Her husband and two daughters are also black belts in our association. I have long been inspired my Ms. Quandt’s dedication to training and teaching her martial art skills. I am glad to have been able to ask her a few questions about her history and motivations in Taekwondo. As I expected, I find her answers to be very inspiring, and I hope they will be to you too. Thank you Ms. Quandt! Ms. Doll: How long have you been studying Taekwondo, and how long have you been teaching? 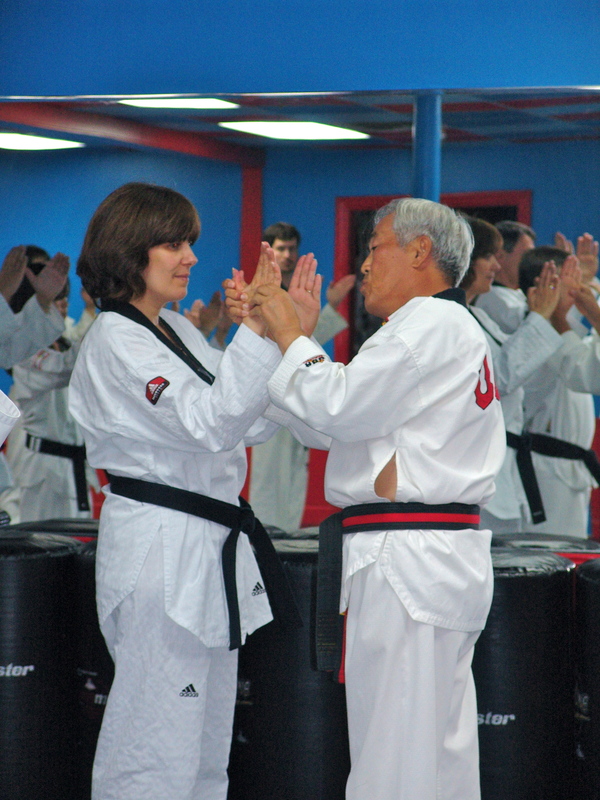 Ms. Quandt: Mr. Quandt and I were married in 1983 and he started Taekwondo in the Spring of 1986. I joined him in the summer of that year because I liked what I saw. We were living in Binghamton, NY. It started out as something I could join with him and it became our obsession for a long time. He stopped going for quite a while because of work, but recently returned and I am grateful to have my partner back! As for teaching, I first used to assist Mr Smith when he taught a provisional class that Shaheen was taking in 1999. I also assisted Ms Elder. Eventually I taught a class during the day at IME and in 2001 the provisional class in the evening when Zarina was getting ready for her 1st poom test. I have always appreciated Master Pearson’s trust in me and am grateful to him for allowing me the opportunity to teach. Ms. Doll: What inspires you to keep practicing? (Clearly you have other things in your life that require attention). Ms. Quandt: Teaching inspires me to keep practicing. Without teaching, I could more easily walk away from parts of the art that don’t excite me. Ms. Doll: What do you like about teaching? Ms. Quandt: Teaching allows me to pass on what has been beneficial to me. It is really about helping other people grow, which in turn helps me grow. Ms. Doll: What is challenging about teaching? Ms. Quandt: Self doubt. I am not as quick, as accurate or as strong as many students I instruct. Ms. Doll: Do you have a regular time that you devote to practicing? Ms. Quandt: I have learned to fit practice in between activities. For example, it is better to stay with the grill and I don’t burn dinner, so that is a perfect time to practice forms. I grill a lot in the summer! Ms. Doll: What advice would you give to students who are starting out? Ms. Quandt: For children I would suggest practicing their forms on their driveway in the morning while waiting for a bus. For parents, I would suggest, joining their kids on the driveway. Ms. Doll: How about for students who have been practicing a couple years? Ms. Quandt: Don’t compare yourself to other students. Focus on what you can do and what you can accomplish. It will make tests easier. Ms. Doll: How do you get kids to listen to you? Ms. Quandt: Kids listen to people that they believe cherish them. Give lots of compliments. 5 compliments before giving 1 suggestion on how to fix something. They will want to please you. Also, it’s OK to use a loud voice as long as your not using an angry voice. Kids get loud and sometimes we need to be where they are in volume. But if something is very important, speak very softly and they will understand that it’s important, kind of like a secret. Ms. Doll: Is there anything else you would like to share? Ms. Quandt: I make plans for my time and my art and God laughs. I can’t imagine not continuing in my art even when I find no time to do the things I planned. For example I planned to have a class a couple of times in July and a couple of times in Aug. Instead I have been working at my flooring business a whole lot this summer. So, it is important to plan a plan and not an outcome. I hope to do impromptu classes yet this summer, but I have no idea how to fit that into my schedule today. Ms. Doll: What do you learn from your martial arts practice that you wouldn’t learn anywhere else? 1) I have no idea how I would ever understand spacial concepts without Taekwondo. I can’t tell you the square feet of a room without measuring it but I can tell you, by looking at the room if I can only do taegeuk 2 or have enough room to do taegeuk 8 in the space. 2) The ability to mediate has been a huge gift and I wish I practiced it more often. 3) It is very curious to me how we take elements and can express ourselves in different ways which embody the quality of any particular element that we envision. Ms. Doll: Do you have any thoughts about Shin Ho Kwan specifically and how it is different from other styles of Taekwondo? Ms. Quandt: Shin Ho Kwan seems to focus on the art of Taekwondo as something, physical, spiritual and mental. It encompasses the whole of our beings. Other schools I have attended focus mostly on the physical and sport of Taekwondo. Also as a color belt Shin Ho Kwan teaches many more areas of Taekwondo that other schools do not touch upon until the student is a black belt. I have not been a black belt in any other school but Mr Quandt has and none of the schools covered a fraction of the material that we learn as black belts. Next PostSummer Blockbuster…ok not quite, but still good.